Da Couch Tomato: Game of Thrones. Season 2, Episode 9: "Blackwater"
What makes this episode different from all the others? That is, aside from the fact that we see nothing of Jon Snow, crows, wildlings, Winterfell, Harrenhal, Robb Stark, or the Kingslayer? Don't worry. We'll still get to see some breasts. What makes this different is the fact that this episode was written by George R.R. Martin. As in the author of the books which this series is based on. The "R.R." is used to differentiate him from the Beatles producer. So what makes this GRRM-penned episode different? As the author of A Song of Ice and Fire, you'd think that Martin's episode would be the one closest to the books. But actually, it's not. Martin knows how to write adaptations, I'll give him that. He knows the difference between the written medium and the visual medium, and he knows how to tell stories using both media. The entire episode takes place in only one location─King's Landing (and of course, in the water). There are no scenes in Winterfell, nor are there any scenes beyond the Wall. But Martin makes up for that by showing us some character depth that no other episode writer can show. He gives us a bit of Bronn's back story, a little tension between two of the fiercest killers in the realm─Bronn and the Hound─and also a sly exchange between Cersei Lannister and Shae the whore handmaiden. And what makes it good is that all the new information we get from this episode now becomes part of the canon, simply because it was George R.R. Martin who wrote it. 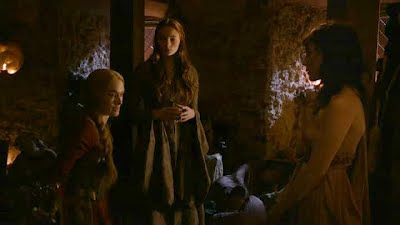 So when Bronn says that his mother broke his nose with an iron poker when he was 5, and when Shae says that she came to Westeros 10 years ago, then those become official facts of the saga. Because George R.R. Martin said so. "GRRM says you're supposed to have only one leg! Here, let me chop it off!" 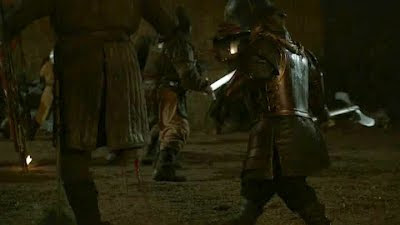 extreme gore and violence, and another half-man speech from Tyrion Lannister, reminiscent of last season, which coincidentally also happened to be the season's ninth episode. And finally, the difference between a GRRM episode and the others are the songs. There are, I believe, more songs in this episode than in the entire season combined. I imagine GRRM saying, "Hey, HBO, my books are full of songs, why doesn't the TV show have any?" These songs aren't just an excuse for Martin to indulge in rhyming poetry; the songs actually add realism to the world of Westeros, making it more believable. After all, before television and the Internet, people had songs to entertain them. I hope George R.R. Martin gets to write more episodes next season. And I hope the next one he writes takes place in the daytime. This one was a little too visually dark for my taste. The Secret Circle. Episode 22: "Family"
New Girl. Episode 24: "See Ya"
Dark Shadows Review, or Is There a Team Burton? The Secret Circle. Episode 21: "Prom"
New Girl. Episode 23: "Backslide"
The Secret Circle. Episode 20: "Traitor"